We support freedom of science and the scientific method in public debate. We support the free trade of goods and services. We support the palm oil business as well as other foods that science has proved to be neither dangerous nor carcinogenic. We also support the freedom of choice against any form of intolerance. Some people ask to ban it from all public places; those who think that forcing our companies to replace it with unhealthy ingredients is an advantage, and those who simply rides the wave of intolerance. Hiding behind the shield of “the common good”, many try to take advantage at the expense of a single ingredient. There are well-established protectionist interests behind this campaign against palm oil. This is a war for the “right” oil and palm oil has been targeted by other producers. In spite of these negative influences, we want to give voice to those who ask to be free to eat whatever they want, including palm oil, and those who fight the anti-scientific populism. We are convinced that the hatred and fury of those who repudiate the principles of science and objectivity must be contrasted with facts and rationality. Palm oil is a vegetable oil that is derived from the fruits of oil palm plants (Elaeis Guineensis or also Elaeis Oleifera and Attalea Maripa). Palm oil (extracted directly from the fruit) and palm kernel oil (extracted from the seeds) are derived from the fruit of the oil palm. At an ambient temperature both oils appear solid or semi-solid. A fractionation process makes it possible to separate the liquid component (bifractionated palm oil, used for frying) and the solid component. The oil from the fruit of the palm has a neutral taste and aroma. It is for this reason too, that it is widely used by the food industry in preference to many other oils. Palm oil originates from west Africa, where there are still many fruit palm plantations. Over the centuries the palm has been exported to Asia, Indonesia and Malaysia in particular, and to other regions with suitable climates. It has been used as a basic foodstuff by many peoples for over 5000 years, because it is a valuable source of fat with a high nutritional contribution. Nowadays, oil palm plantations can be found in 43 countries. The major producers are Indonesia and Malaysia, and they produce around 85% of the world’s total (Foreign Agricultural Service 2017). This raw material is used by different types of industries. Food, chemical, oil-chemical and cosmetics are the main sectors of use. According to Eurostat data, imports of palm oil in 2013 totalled 1,038,887 tonnes divided almost equally between use in food products (500,000 tonnes) and technical uses* (538,000 tonnes). In 2015 imports totalled 982,773 tonnes, but the intended use in foodstuffs fell by approximately 115,000 tonnes, whereas imports of palm oil for technical uses rose slightly (596,000 tonnes). The year 2016 was also characterised by a drop in imports of palm oil: 811,131 tonnes, i.e. -17.5% compared to 2015. Imports for food use fell by 7%, whereas those for technical uses fell by about a quarter. Compared to 2013, imports of palm oil in 2016, intended for use in the food industry, fell by 29%. In Italy approximately 21% of the oil imported is used by the food industry, with the remaining 79% being used in the oil-chemical industry–in particular for the production of biofuels–and in the cosmetic industry (Source: Istat Coeweb 2016). *“Technical use” is intended to indicate the use of palm oil, as an ingredient, in the chemical, oil-chemical, cosmetics and manufacturing industries in general. 3. Why is it used by the food industry? 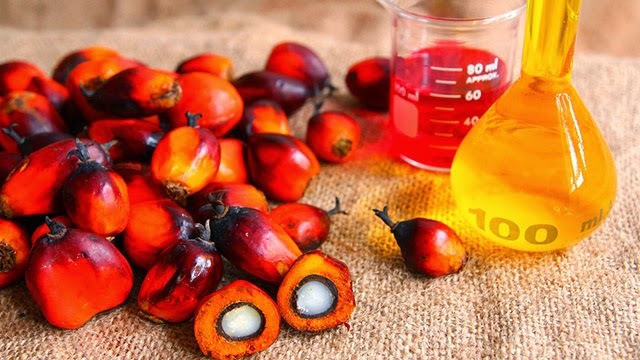 Because of its versatility, palm oil is used in different sectors including food, cosmetics, chemical and energy. it is often used for producing oven-baked products and desserts, without resorting to the use of partly hydrogenated oils. its resistance to high temperatures and oxidation makes it particularly suitable, compared to other oils and fats, for use in foodstuffs processed at high temperatures. Moreover, its high stability makes it suitable for guaranteeing foodstuffs longer shelf-lives, leading also to a reduction in waste. 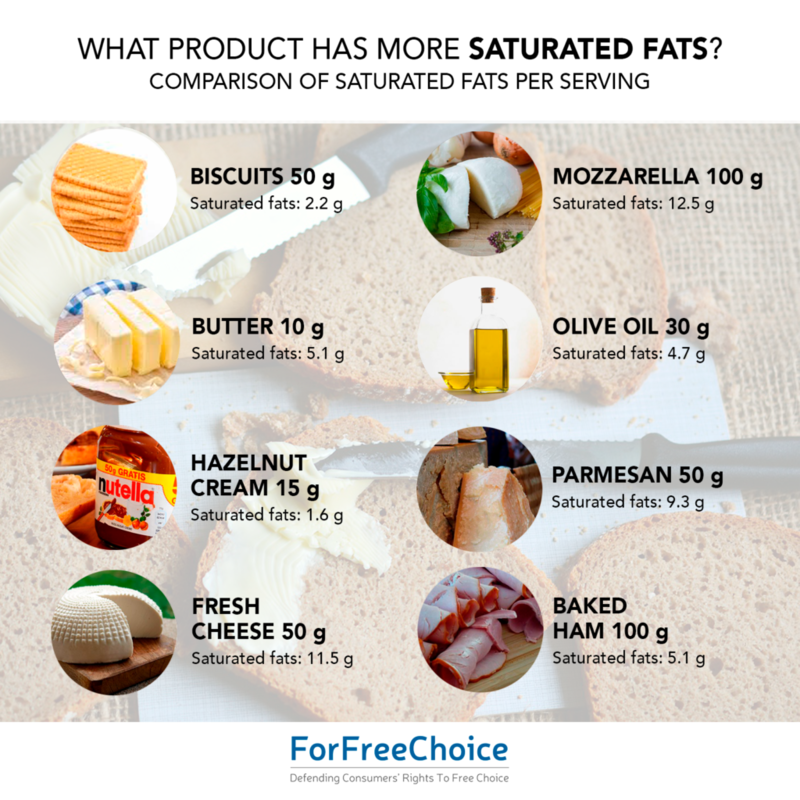 Saturated fats, in fact, have rheological properties that render them suitable in many food applications. There are currently no alternatives that, on a technological level and in terms of consumer satisfaction, are perfect equivalents, for the use of palm oil and its derivates in the production of foodstuffs such as, above all, oven-baked products. 4. Is it bad for your health? No. Like many other ingredients, if used as part of a balanced diet, palm oil is not harmful. A scientific review published in the International Journal of Food Science and Nutrition, conducted by Drs. Elena Fattore and Roberto Fanelli of the Mario Negri Institute, confirmed that palm oil is not injurious to health, not to mention carcinogenic. A recent (2017) study by the Nutrition Foundation of Italy (NFI) entitled “Uso alimentare dell’olio di palma. Effetti sulla salute umana” (Use of palm oil as food. Effects on human health) confirmed that the effects of palm oil on health are similar to those of other oils and fats rich in saturated fatty acids, such as butter, and that if consumed in moderation, as part of a balanced diet, it is not harmful. In particular it maintains that: “there are no direct epidemiological data on the possible relationship between the consumption of palm oil and the risk of cancer. The indirect evidence indicates that, in all probability, the consumption of palm oil with pre-packaged foods, as part of a balanced diet, does not have a significant role, when it comes to the risk of cancer (or on protection)”. The EFSA (European Food Safety Agency) report, published in 2016 is a subject that has been discussed among palm oil detractors and supporters. To clarify. The Agency’s view does not maintain that palm oil is harmful to human health or carcinogenic. It focuses instead on a number of risks deriving from the possible presence of contaminants, such as glycidyl esters and 3-MCPDs. These contaminants can be formed during the processing of all vegetable oils (not just palm oil) at temperatures in excess of 200 degrees. When it comes to 3-MCPD, the EFSA, that has not conducted any experiments on humans but on mice, has set a tolerable per-body-weight intake level, that is problem-free for humans, of 0.8 mg/kg. 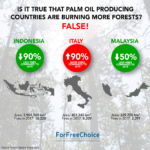 Following the manipulation of this study, even by the media, some EFSA spokespersons, such as Dr Marco Binaglia, who were involved in the drafting of the report, stressed that the boycotting or demonization of palm oil serves no purpose and, above all, it makes no sense (the full interview can be viewed on this link). In November 2016 a pool of researchers, made up of experts from the FAO and WHO, the JECFA group, reached different conclusions to those of the EFSA. Re-examining the potential exposure of humans to contaminants that are formed in all vegetable oils processed at temperatures exceeding 200 degrees, JECFA, in the new review, maintained that the risks deriving from human exposure to the contaminants are significantly lower, compared to the levels identified by the EFSA. For the 3-MCPD, JECFA indicates a tolerable intake, that is problem free for humans, of 4 micrograms a day for every kilogram of bodyweight. A limit that is by far higher than the 0.8 micrograms per kilogram of body weight indicated by the EFSA. JECFA highlights that the population (including large-scale consumers) would not exceed the new safety threshold, because the intake levels of contaminants in question are today already below the alert level. In the face of these latest data, the EFSA has set itself the task of reviewing its report by next Autumn 2017. See, with reference to this, what was reported by Reuters that interviewed an expert from the EFSA. The ISS (the Italian Higher Institute of Health) instead analysed palm oil and its consumption, as requested by Italy’s Ministry of Health, excluding from it any correlation and/or evidence with the appearance of cardiovascular problems and those linked to tumours. In its natural state palm oil is also rich in carotenoids: it contains between 15 and 30 times more compared to carrots and tomatoes. It also contains tocotrienols and tocopherols, rich in vitamin E, for which it has been demonstrated that they make a key contribution to protecting against cancers and the reversal of neuro-degenerative processes. During industrial processing part of the tocotrienols and tocopherols are lost as is the level of carotenoids. Palm oil is not obtained from genetically modified organisms and is trans-fat-free. It is, in fact, used in food products as a substitute for partly hydrogenated vegetable oils, that are harmful from a health perspective (hydrogenation, that is a technique used for “hardening” liquid oils at ambient temperatures, brings on the formation of dangerous trans fats which in turn increase the bad cholesterol, LDL, and reduce the level of the good cholesterol, HDL). 5. Is “Palm oil free” synonymous with increased healthiness? No. Food companies obviously use the “palm oil free” claim for marketing reasons. 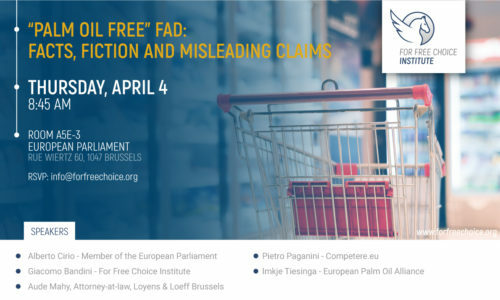 But as the study by Campagne Liberali has shown, the level of saturated fats in products in which palm oil has been replaced with other fats, is at times higher than in products that contain palm oil, and often similar. From the table below, based on original labels and nutritional values on a significant sample of packaged products, it appears evident that the “no palm oil = increased healthiness” paradigm is false. In any case the guidelines published and distributed by the WHO, in Fact Sheet 394 of September 2015, recommend not exceeding the 10% threshold of the daily calorie requirement deriving from saturated fat consumption. In general, as also reported by the Ministry of Health and by the body named INRAN(now CRA-NUT): “The quantities of fats that ensure a good state of health vary from person to person, depending on their gender, age and lifestyle. An indicative quantity for an adult is that which supplies from 20 to 25% of total dietary calories (for sedentary subjects) and up to a maximum of 35% (for subjects with intense physical activities). 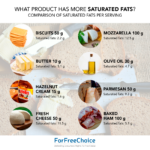 These scientific indications confirm how it is conceptually erroneous to consider a diet that is free of saturated fats systematically better or healthier compared to a balanced diet where saturated fats do not exceed 10% of the total daily calorie intake. It is also worth remembering that saturated fats are components of cellular membranes, they regulate inter-cellular communication, and are the precursors of hormones. At a food level, therefore, if consumed as part of a balanced diet, they are not harmful and the human body’s need to consume them varies according to age: in the early years of life a human being needs to consume a higher percentage (SIPSP – Italian Society of Preventive and Social Paediatrics, 2017). As Vito Leonardo Miniello, Vice President of SIPSP stated: “With a view to countering the saga of misinformation, it is fitting to consider that 40% of the total fat in breast milk is made up of saturated fats and of this 50% is represented by palmitic acid, that is particularly present in palm olein”. 6. 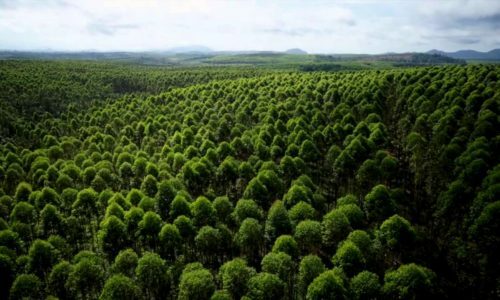 Is palm oil the main cause of deforestation? No. Because of their high yield, oil palm plantations are the most sustainable, and preferable to any other type of oil crop. The FAO Global Forest Resource Assessment of 2015 estimates that the contribution of oil palm plantations to global tropical deforestation is approximately 5%. In Indonesia, in 2016, just 11% of forest fires occurred on territorial concessions for the farming of oil palm. The figures demonstrate that deforestation and forest fires must be tackled and analysed on an aggregate basis. The purchase of sustainable palm oil is, in fact, a good step towards the preservation of tropical forests. If palm oil were to be eliminated, there would be no guarantees over the sustainability of other products nor on the effects on forests. It is for this reason that some organisations are working for a sustainable production of palm oil. 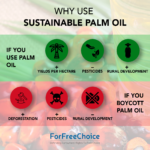 Greenpeace and WWF, for example, support the work of the Palm Oil Innovations Group (POIG), that is aiming to break the link between palm oil production and deforestation, land grabbing, and the denial of workers’ rights and those of local communities. The group focuses on three areas: environmental responsibility, partnerships with local communities and corporate and product integrity. 7. Will eliminating palm oil benefit the environment? No. 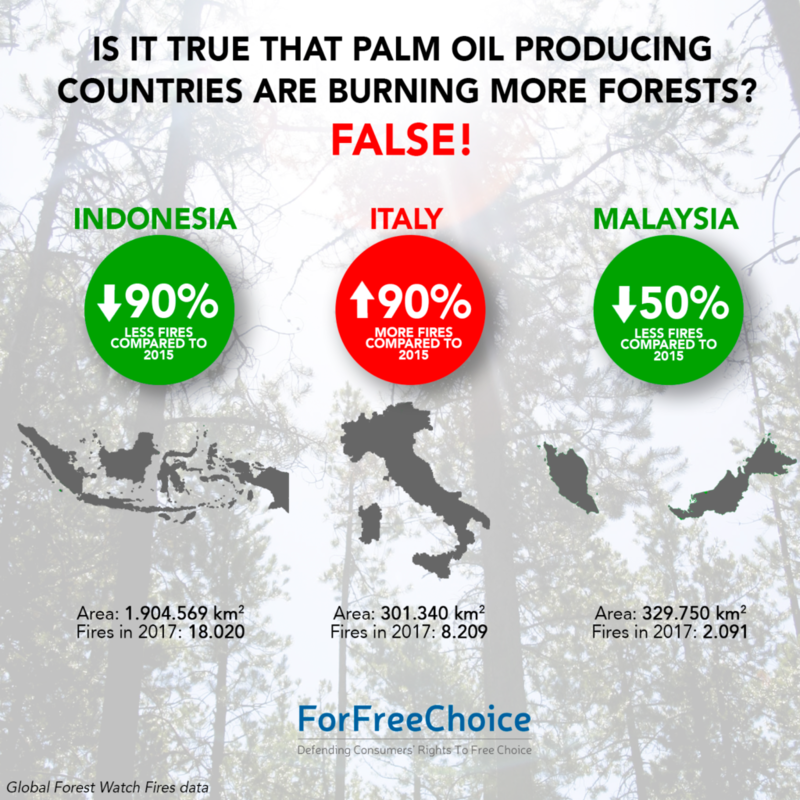 Palm oil is not the primary cause of deforestation on a global level. 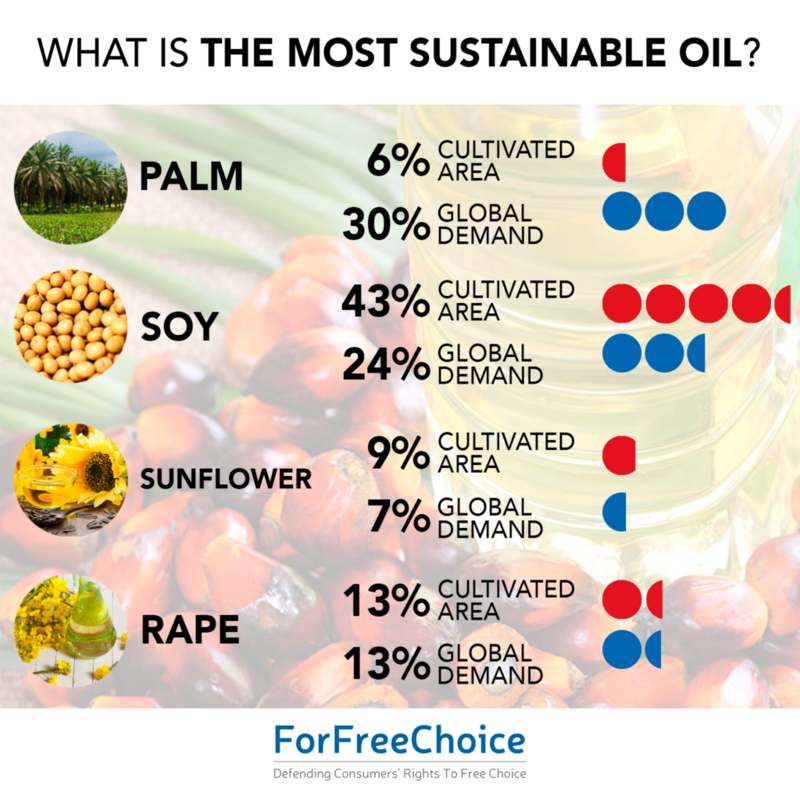 Of all crops, oil palm plantations are the most sustainable. Once oil palm plantations have been eliminated, they could be replaced with other less sustainable crops, causing obvious harm to the environment. 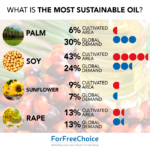 In actual fact, oil palm has an average yield of 3.62 tonnes per hectare: 5 times greater than that of rapeseed (0.75 tonnes/hectare) and no less than 9 times that of soy (0.37 tonnes/hectare). The farming of oil palm plants, around the world as a whole, takes up 17 million hectares of land, that is to say 6% of the total of farmed land, and it supplies 35% of the world’s requirement for vegetable oil. No fewer than 111 million hectares are what is needed, because soy only guarantees 27% of the world’s requirement. In addition to having a higher yield per hectare, compared to other vegetable oils, palm oil requires less fertilizer, pesticides and energy than soy and rapeseed. 8. Why have some companies abandoned palm oil? The reason is evidently commercial. The war on palm oil, at a European level, began in France as a result of pressure from rapeseed oil producers, for reasons that were clearly commercial. The campaign actually ended the moment that the French government found an agreement with rapeseed growers and exporting countries. The situation in Italy, on the other hand, is more complicated. Many food sector companies have chosen to take advantage of the campaign against palm oil in order to improve their own position in the market and attract a larger slice of consumers. Some have done so by supporting the stance of different health enthusiasts and environmental groups against palm oil. The reasons are also emotive, due to the fear of losing market shares following the continuous attacks on this ingredient by the media and politicians. 9. What has palm oil been replaced with? As highlighted in the comparative study produced by Campagne Liberali on labels and the nutritional values of a number of packaged products from the large retail sector, it has been replaced by other vegetable oils and fats such as sunflower, rapeseed, coconut, shea, maize seed and safflower oils and butter. This has not always led to an improvement, in absolute terms, of the nutritional profile, as conversely stated by different producers. The following table, along with the one shown previously, demonstrates this empirical evidence. Many of the products that have replaced palm oil have a greater presence of saturated fats than those that actually use it. 10. 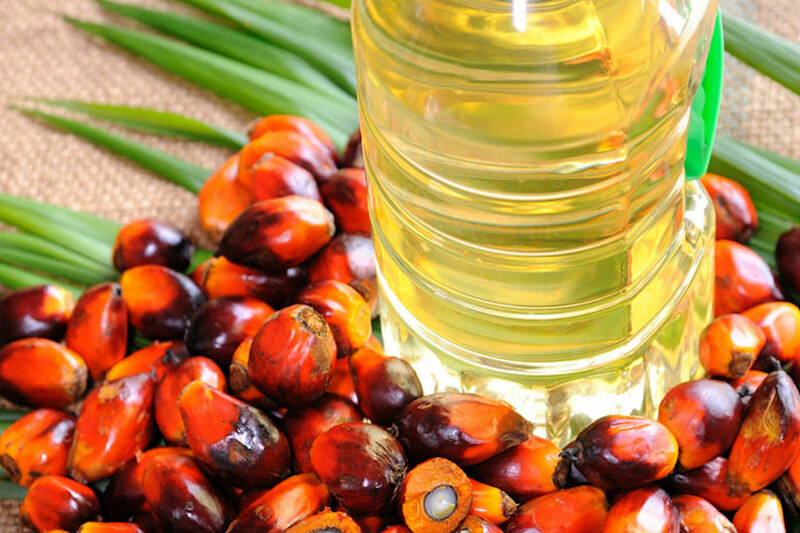 Replacing palm oil has benefited consumers. False. Consumers have received erroneous information that is not scientific and is above all ideological, and so they have fallen prey to misinformation for purely commercial purposes. The “palm oil free” labels, in fact, deceive consumers and fool them into purchasing and consuming a healthier product, under the presumption that “palm oil = harmful”. As different scientific studies have shown, this is not so. At the same time, as a recent study by Campagne Liberali has demonstrated, the nutritional profile of products in which palm oil has been substituted has not always improved significantly. In different cases, products containing palm oil have a nutritional profile that, from the standpoint of saturated fats, is better. Moreover, the “free-from” wording that appears on packaging is often used for commercial purposes with the clear aim of persuading consumers to purchase the product. 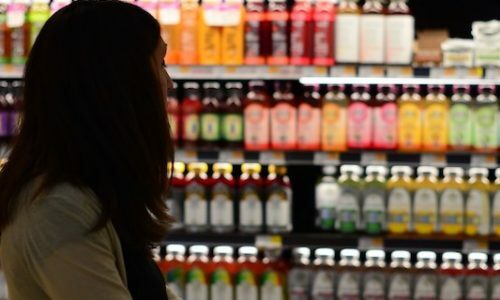 The way that the claim influences consumer choices has been analysed by different studies such as the one produced by Priven M, Baum J, Vieira E, Fung T, Herbold N. (2015), The Influence of a Factitious Free-From Food Product Label on Consumer Perceptions of Healthfulness or that by the EUFIC (2017) Consumer Attitudes Towards “Free-From” Labels. Consumers are in this way led into believing that the “free-from” wording on packaging corresponds to healthier products linked to increased wellbeing. 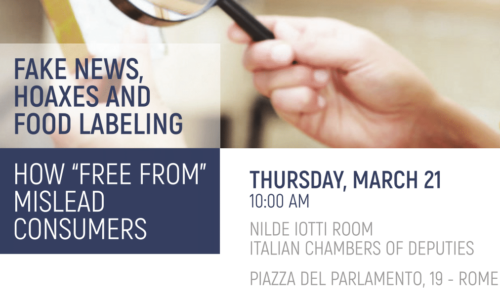 In this sense, many of the “free-from” labels are therefore misleading because they induce consumers into buying products that are not necessarily healthier or safer or more environmentally friendly. 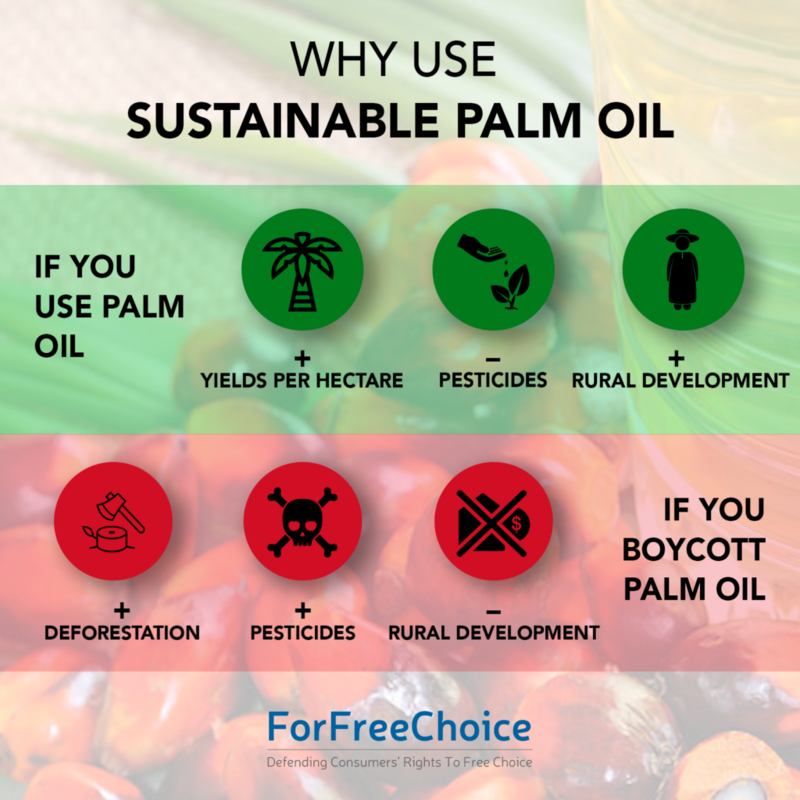 The case of the “palm oil-free” claim is exemplary. In addition to this, in the case of palm oil the extremely powerful media campaign of recent years has contributed to the bestowing of a health value to a simple piece of information that has revealed itself to be fundamental in marketing choices. In some cases, companies that have removed palm oil from their own formulae have made use of the so-called “precautionary principle”. It has, however, been used inappropriately and, in doing so, it is possible to hypothesise that the consumer has been duped for commercial ends. When it comes to the precautionary principle, there is, in fact, a regulation, namely EC No. 178/2002, Article 7, which states that said principle must guide the action of public authorities, both EU as well as national, in those cases in which “the possibility of harmful effects on health is identified but scientific uncertainty persists”. Only in the presence of these conditions can authorities, and NOT companies, act with forecasts that are also restrictive towards products, substances and foods on the market. In the case of palm oil, no authority, either local or national, has deemed it necessary to apply the precautionary principle as is the case for many other thousands of products. The companies that use this expression to justify the replacement of palm oil are aware they are doing so inappropriately and that they are failing to comply with European regulations. ASSITOL (Italian Association of Olive Oil Producers), Monitoring flows of olive and pomace oils, March 2015. The Guardian: “From rainforest to your cupboard: the real story of palm oil – interactive”, 10 November 2014.